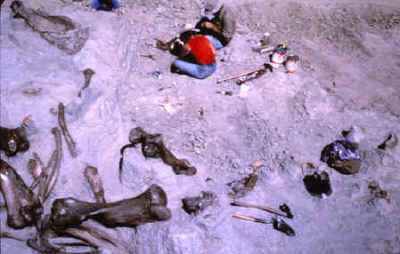 Lange Ferguson Mammoth Kill Site. This picture was taken in 1980 of the main bone concentration. Clovis hunters apparently either killed or scavenged two mammoths 12,850 years ago in what at the time was a marsh or bog. Three Clovis points were found in this bone bed. 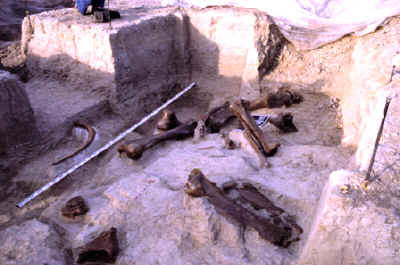 Most Clovis kill sites involve mammoths but other large animals such as mastodons and bison have also been found on these sites. 10,000 B.C.-----Earliest domesticated animal was the dog in Iraqi Kurdistan. 12,000 B.C.-----First grindstones in Upper Egypt & Nubia--making flour from grass seeds. 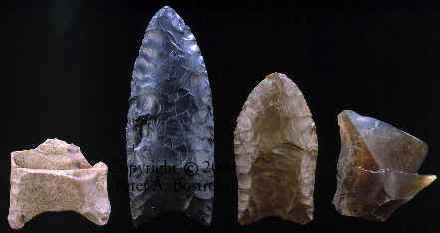 12,000 B.C.----Clovis people are the oldest recognized cultural tradition in North America. This picture was taken in 1981 and shows three excavators working in the main bone bed at Lange-Ferguson. Excavation of this site began in 1980 and continued into 1984. Bone beds are the most difficult to excavate. One problem is the organic material begins to deteriorate when exposed to the air. The bones require special chemical treatment to preserve them. They also need special handling for transport to a storage facility and the larger specimens are encased in plaster jackets. These three Clovis points and one flake are the only stone artifacts found with the two mammoths on the Lange - Ferguson mammoth kill site. The translucent amber flake to the right could have been used for cutting small pieces of the meat. This is the smallest projectile point that was found during the excavation of the Lange - Ferguson Mammoth Kill site. It has been extensively resharpened to it's current length of only 1 1/2 (38 mm) inches. 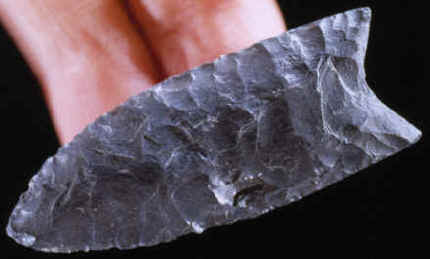 When Clovis spear points became damaged from impact fracturing and edge wear from cutting they were resharpened until they were eventually used up. 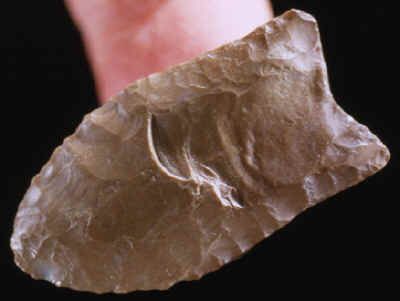 This Clovis point has been reduced to no more than half its original size and probably would have been discarded before any more resharpening. 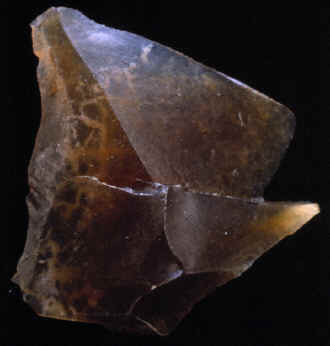 This single percussion flake was found in direct association with mammoth bones in the central bone bed concentration. It's made of Scenic Chalcedony and measures 1 3/16 inches long (28 mm).